Strategy games come in all shapes and sizes, so if you want to stand out these days, you have to bring something special or unique to the table. And with Halloween fast approaching, a strategy game with some spooky mechanics would really hit the spot. 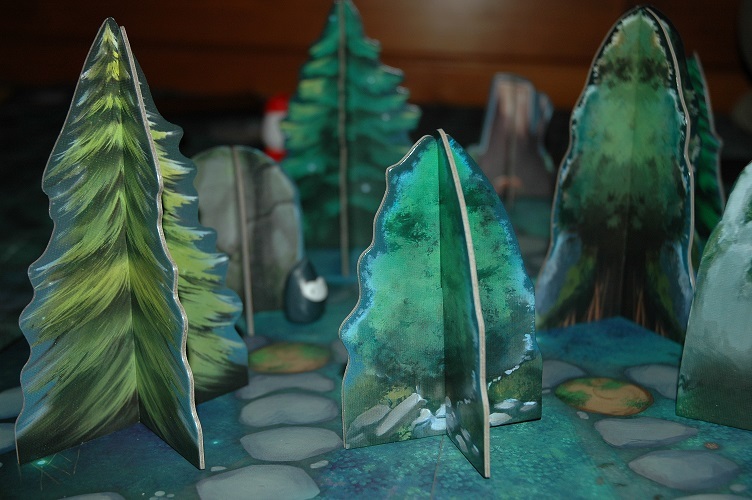 ThinkFun’s latest strategy game, Shadows in the Forest, fits the bill nicely, delivering one bright idea with a twist: it’s played in the dark. 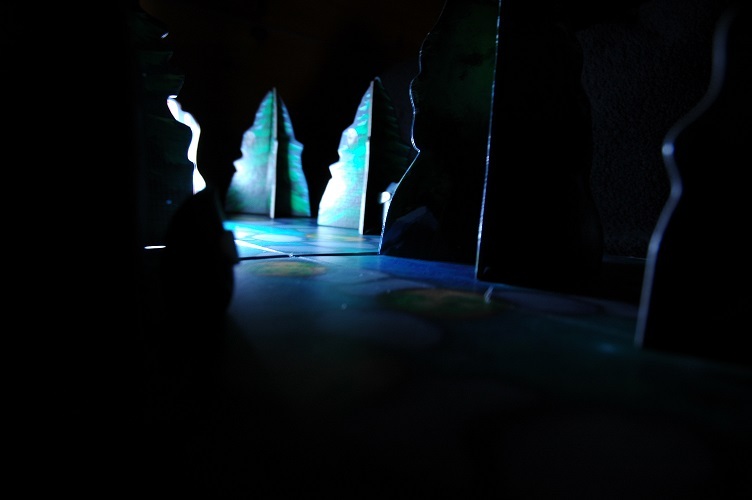 Designed for 2-7 players, ages 8 and up, Shadows in the Forest is essentially an elaborate round of Hide and Seek. 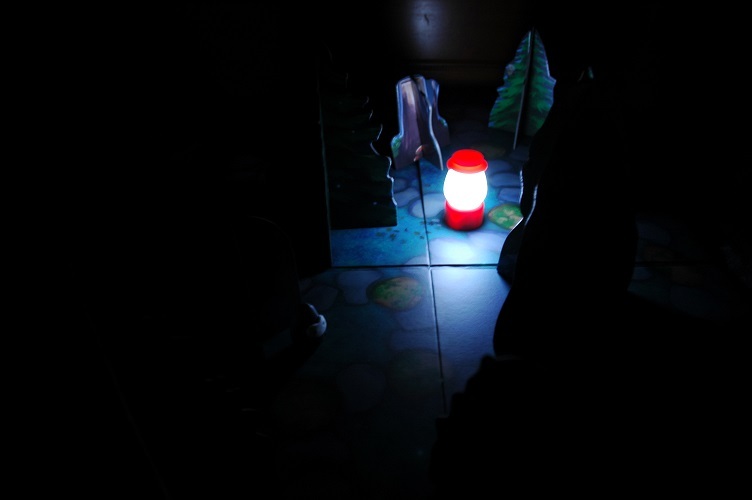 One player is the Seeker, a lantern-wielding explorer who is wandering the woods searching for Shadowlings, peculiar creatures that lurk in the shadows and are vulnerable to light. The other players are the Shadowlings, working together to stay out of the light and thwart the Seeker. 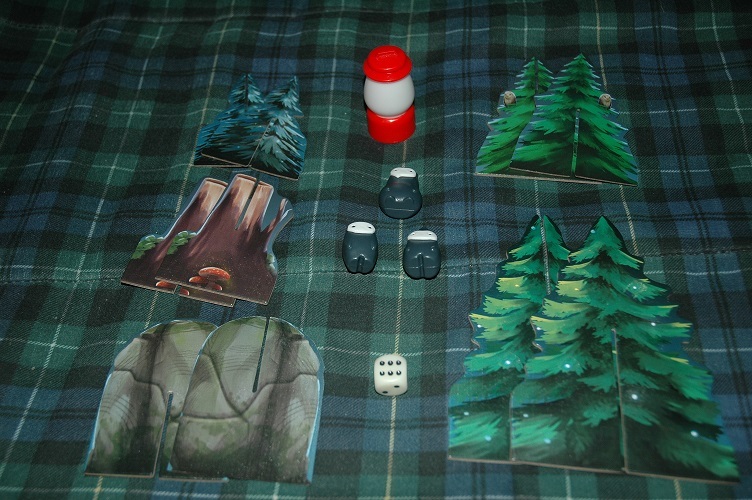 First, you set up the board, assembling and placing the physical obstacles — trees, stumps, rocks, etc. — that will create shadows for the Shadowlings to hide in. Now the Seeker has to shut their eyes as the other players place the Shadowlings in the shadows created by the lantern. Once the Seeker opens their eyes, the game begins. The Seeker uses the die to determine how many spaces the lantern moves. Any Shadowlings revealed by the lantern during the Seeker’s turn are frozen in place, and the Seeker takes their masks. Those unmasked Shadowlings are unable to move until they are unfrozen by other Shadowlings. Once the Seeker’s turn is done, the Seeker closes their eyes, and the Shadowlings move. Unlike the Seeker (whose lantern has to stick to the path), the Shadowlings can be moved anywhere on the board. They don’t need to stick to the path or adhere to a die roll to determine how far they can travel. The goal of the Seeker is to freeze all of the Shadowlings and take their masks. The goal of the Shadowlings (who play as a team) is to gather every Shadowling on the board in the same shadowy place. It’s an intriguing hook for a game, but unfortunately, the instruction manual is vague and not terribly intuitive. It does a poor job of explaining both how the Shadowlings move and how they unfreeze Shadowlings touched by the light. In each of our test games, we had to resort to house rules and clarifications in order to play the game. For instance, even while hiding, we decided the Shadowlings should face outward (away from the obstacle), so their masks would shine brighter if the light revealed them. Additionally, we made Shadowling players trace their intended path along the board with their finger first, in order to reveal if they touched the light of the lantern at any point. Once we’d established these ground rules, the game really came together. It becomes a battle of strategy. The Seeker tries to reveal and freeze the Shadowlings in place while searching for others, while the Shadowlings must outmaneuver the lantern, stay in the shadows, rescue their pals, and mass in one place. It’s amazing how a simple movement of the lantern piece can not only bisect the board and pin down the Shadowlings, but alter the shadows on the board in unexpected ways. The obstacles are easy to assemble and disassemble, and the battery-operated lantern (batteries included!) throws off a surprising amount of light for its size. The Shadowlings are adorable, each with their own little look and personality, and yet, easily vanishing into the darkness. This game has style to burn. 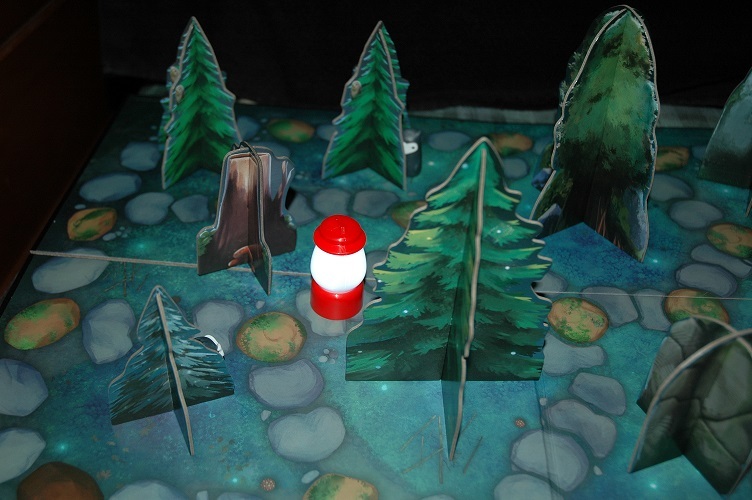 Although adults can play the game, we found that games either ended very quickly (if the Seeker rolls poorly or the Shadowlings were massed on the far side of the board from the lantern) or lasted a very long time (similar to chess games where the pieces on both sides are depleted and players simply chase each other around the board endlessly). 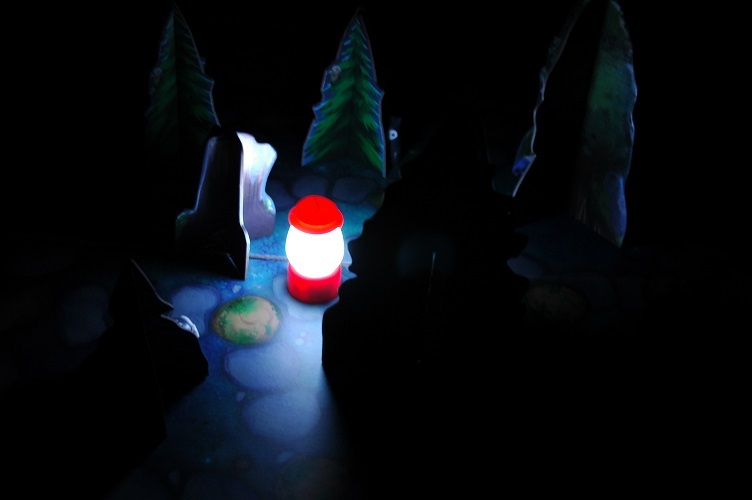 But when playing with younger solvers, the Shadowling team play and the convention of playing in the dark made for a unique gaming experience — particularly if an adult is the Seeker, and one adult joins the Shadowling team of younger players. Seeing the kids conspire against the adult to lurk in the shadows is a delight. 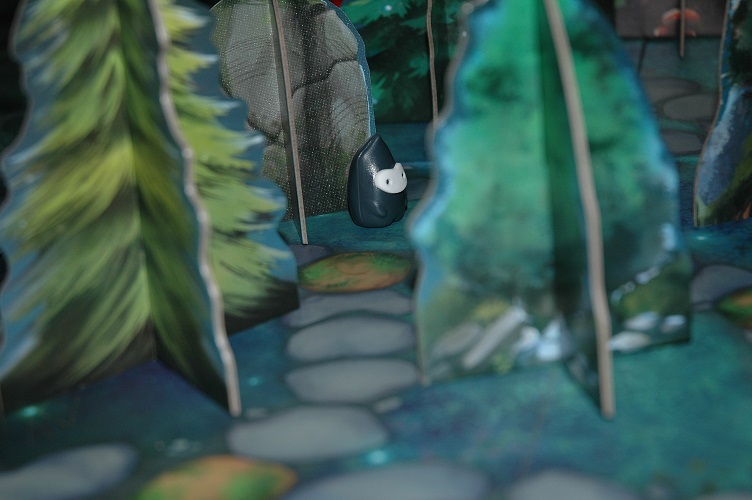 In the end, Shadows in the Forest is a fantastic idea for a game that, while not executed to perfection, still makes for a fun time. 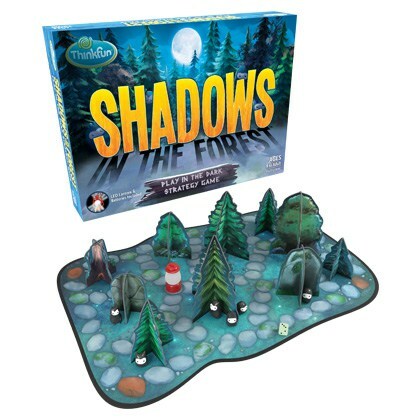 ThinkFun’s Shadows in the Forest is currently available at Target, Amazon, and participating retailers, for $24.99.